From all the christian movies that I watch this is the one that really touch me. Wonderful movie. This brings the importance of prayer to the fore front. 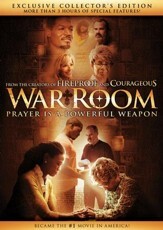 A great movie that conveys the power of prayers when we accept to work with God through our commitment to pray. This was an excellent film. I purchased this DVD to give as a Christmas Gift for my brother and his family!